We are offering Marble Pillar Watch to our client. Marble Pillar Watch For Corporate Gifting and Home Decorations. The Marble Pillar Watch provided by us is made using sturdy marble. It is aesthetically appealing in addition to being strong. 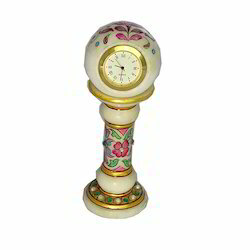 Gold Painted Meenakari Work Marble Pillar Watch. 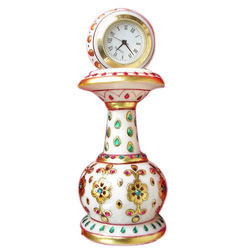 This handcrafted standing clock is made of pure makrana marble, gold painted and decorated with colourful beads. It is a show piece for your drawing room. This beautiful decorative time piece features a circular watch placed on top of the pillar. Its adorned with minakari work & beads. We are offering Marble Pillar Watch to our clients. Marble Green Color Pillar Watch.